For the October meeting we changed things up a bit and instead of a member spotlight we focused on showing off our Round Robin Challenge pieces. 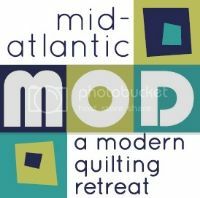 Each participant created a center block or blocks and passed it onto another quilter who added onto the center in any way they wanted; then it was passed again. The images below speak to the creativity, talent and imagination of the Philly MQG members. The challenge is ongoing and members can choose to pull their pieces when they feel that it is complete. Members - feel free to jump into the challenge at any time, just bring your starter block to the next meeting! These pieces are so inspiring! Everyone is doing such a great job!